1. All members of each team should be gathered together at least 10 minutes before their match begins (make sure you know the right match schedule for your own team). 2. The list of order for match can be changed. 3. GM will message the game room number and password for entering the game room to the team leader, and the team leader is to bring all of the players to the room. Note that the password should not be shared to other players except the team members. 4. One of the GMs will be entering the game room as an observer and record the whole match. 6. Note that all members should be in “ready” mode before starting the match, otherwise you might have a few members missing in the actual match. After all matches are finished, the next match table will be announced. The winner prepares next day’s match with the same rules as above again. *Note that the match schedule is created by a schedule program that picks teams randomly. - The tournament matches will be held in Colosseum with the usual tournament match method, and NOT in the DWC mode. All cash items are usable. - Every match will be recorded and it can be published, depending on the situation, so inappropriate language such as slang is prohibited. All Participants should be noted that all the game scene may be published as a video clip. 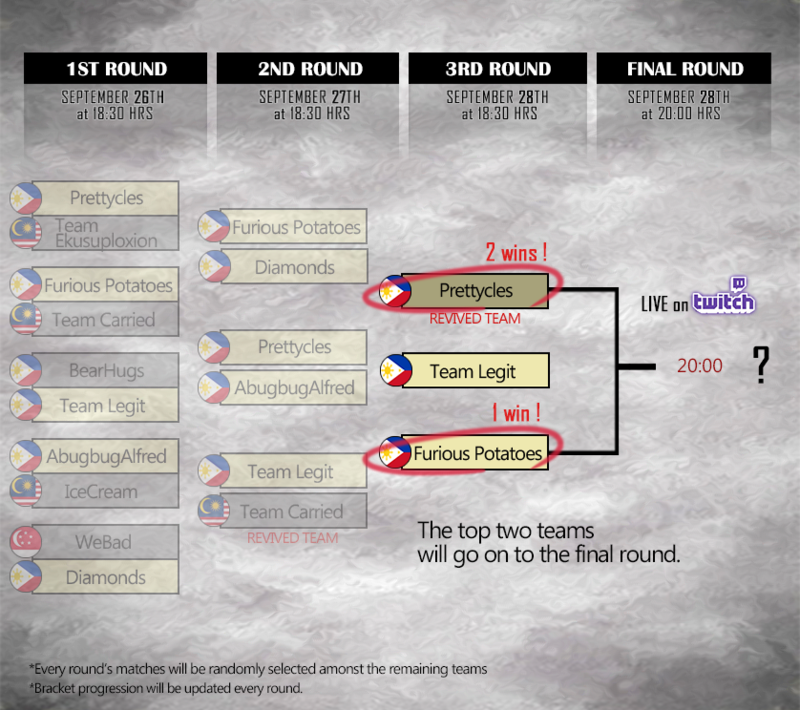 - Tournament brackets cannot be changed arbitrarily. - In the event of a service lag or disconnection in the middle of the game, rematch may happen. In case of server disconnection, rematch may occur when at least two players or GM disconnect from the server. If only one player is disconnected from the server, we will not have the rematch. - In the event any player is not "ready", the game will be proceeded without the player. - If the whole teammates don’t gather together in time, we assume they are disqualified and are considered to be defeated. - If one of the teammates’ character is not Lv. 95, we assume they are disqualified and are considered to be defeated. - If there is a problem such as outbreak situation in the middle of the match, GM's decision will be final. In the case of the server problem, the announcement will be delivered via Facebook. So please check the Facebook in real-time. It has been found that an unauthorized program was being used in the tournament. Using foreign unauthorized programs such as "MOD" that modify the view of the game is a clear violation of match fairness. Due to this recent finding, the match brackets for today's tournament has been adjusted. Please be aware that any teams that use unauthorized programs that is not part of the game client will be immediately disqualified. *There will be no consolation matches today. *Match between three teams: All three teams will have a match with each other. The top two will proceed to the final round. *Teams are allowed to change their lineups. All cash items are allowed. *All team members must arrive 10 minutes before their match time. *Depending on the 3rd round match results, the final match time may be adjusted. The Final match between the remaining 2 teams will be shown LIVE on Twitch. - The respective prizes for the teams will be given to each member through their Special Storage on 5th October during Update Maintenance. - The rewards will be collectable within one week, until 12th October 23:59 HRS (GMT+8). - The 4th~7th Ranking is shown in random order. - Teams that were disqualified/didn't show up for the match are excluded from receiving the prizes. - The winning team will receive the official email regarding 2018 DWC within October, requesting the information and paperworks needed to participate in the DWC in China. 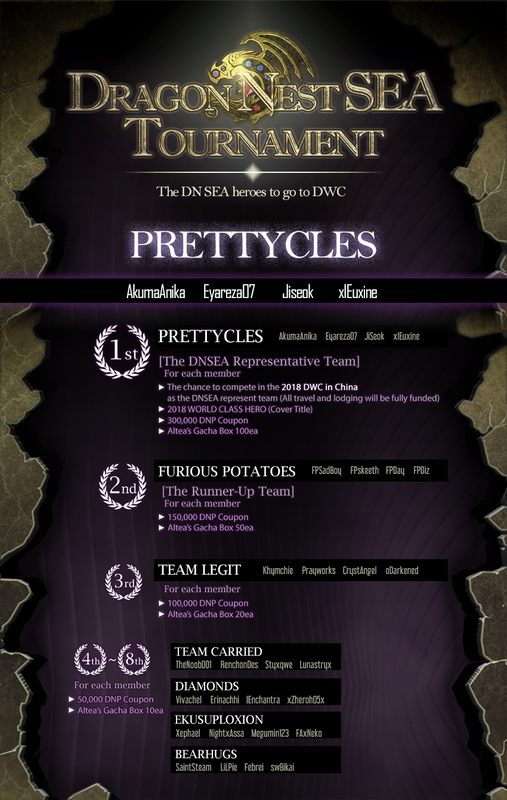 All necessary information, rules and guidelines of DWC will be informed to the winning team.